ECCT’s smart devices can be scanned and read out by NFC enhanced smartphones on which the Mediccinet™ app has been installed. 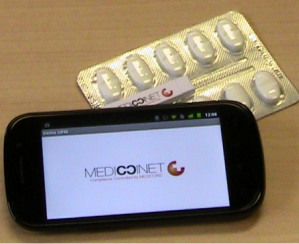 The user touches the smart device with the phone and the data stored in the device (temperatures, pill events, IDs etc.) is transferred via the NFC interface to the phone where it is stored and displayed. The phone can also set up a secure Internet connection with the Mediccinet™ database (password protected) so that the data can be sent for remote storage or further analysis by the physician or point of care. ECCT’s smartphone app can be customized to suit specific customer requirements. Contact us for further information or for a free trial of the MediccinetTM smartphone app.